Two recent films, each nominated for an Academy Award for Best Picture, help white America understand the challenges and struggles of black America from different perspectives. On the one hand, “Fences” is a story that shines a light on the challenges and issues faced by black families in the 1950s. On the other hand, in “Hidden Figures,” we have Hollywood telling the amazing story of three immensely talented black women who made invaluable contributions to NASA and the American space program. August Wilson has been called one of the finest American playwrights of the 20th century. His plays have highlighted and brought to life African Americans in everyday roles dealing with everyday issues including love, struggle, duty, and betrayal. The impetus behind his plays was so white Americans could begin to see African Americans in a different light; see them dealing with the same issues that define life for most whites so that whites just might treat African Americans differently. “Fences” was one of his best-known plays for which he received both a Pulitzer and a Tony award. In 2016, “Fences” came to the big screen directed by Denzel Washington. His main support is his long-suffering wife, Rose, played brilliantly by Viola Davis, who won the 2010 Tony for best actress in the role and the 2017 Oscar for Best Supporting Actress for the same role (her Oscar acceptance speech was deeply moving). Yet, Troy cannot see the obvious — how Rose has been the one not only standing by his side all those years but also the one holding the family together, trying to smooth the sometimes disjointed relationship Troy has with his two sons and his mentally challenged brother. Instead he turns secretly to another woman to satisfy his need to feel like a man again; to be loved. He works hard to convince himself that it is a harmless flirtation that doesn’t mean anything. Troy is almost like a juggler trying to keep multiple elements of his fractured life in the air, hoping they don’t come falling down around him. Nor can he see the love and admiration that his youngest son, Cory, has for him. A proud man who never went to school or learned to read, Troy’s main concern is that Cory have a steady job so once he graduates from high school, he has some hope for the future. But Cory has his own dreams and aspirations that conflict with his father’s. As a result, Troy manages to extinguish that love when he tries to destroy his own son’s hope for a future as a football player and mold him in Troy’s image. The official trailer for “Fences” (courtesy Paramount Pictures). It all begins to unravel when Troy finds out that he is going to be a father again – though not by his wife. Knowing he cannot hide the flirtation any longer, he confesses everything to Rose. That is when we see Rose’s full emotions come spilling out. She goes head to head with her husband, reminding him that just as much as he suffered, she was right there beside him suffering as well. It is at this moment that Troy is no longer the head of the household. It subtly shifts to Rose. Rose’s ability to rise above the situation is clearly noted when his girlfriend dies in childbirth, forcing Troy to take in the baby, and Rose ends up raising the child. “Fences” pulls at our emotions and draws us into the Maxson family dynamic. Denzel Washington allows us to see Troy Maxson with all his rough edges trying to make sense of his life. The blend of dysfunctional relationships in the movie are Wilson at his best. The movie is worth seeing to get a glimpse of the struggles that could be found in any family in the 1950s as brought to life by a gifted cast. “Hidden Figures” is also a brilliant piece of cinematic storytelling that shines a light on the previously unknown contributions of three profound African American women to the American space program and the first manned orbital flight by astronaut John Glenn in 1962. In contrast to the harshness of life as an African American family in the 1950s, “Hidden Figures” highlights the ingenuity and innovative character of Katherine Johnson, Dorothy Vaughan and Mary Jackson. All were mathematicians who were undiscovered until preparations began to launch the Mercury-Atlas 6 spaceflight in which Glenn orbited the earth three times, the first American to do so. As noted by the three actresses during last month’s Oscar telecast, none of them had ever heard of these women and their tremendous heritage for not only African Americans but also African American women. Katherine Johnson (Taraji Henson) was essential in calculating the numbers that would bring Glenn back to earth. Nicknamed the “human computer,” Johnson was responsible for calculating orbital trajectories, launch windows and emergency plans to bring Glenn home safely – something the team at NASA was not able to figure out. Dorothy Vaughan (Octavia Spencer) learned how to use the new mainframe computer system that had just been installed in NASA. At a time when few people understood the system, let alone the FORTRAN programming language, Vaughan foresaw the coming computer age and taught herself FORTRAN. But she did not stop there. Vaughan, fearing the African American staff she supervised at Langley would lose their jobs once the computers came in, trained all the women in her section in computer programming and how to run the system, making them indispensable. Mary Jackson (Janelle Monae), also a mathematician, was the first black woman to break the color barrier when she became NASA’s first black female engineer. The official trailer for “Hidden Figures” (courtesy of 20th Century Fox). Each of the three women worked in what was called the West Area Computing division. The people in the division had amazing math skills and performed their tasks by hand, without the aid of a computer. Johnson, Vaughan and Jackson quickly rose to the top with their extraordinary skills and willingness to speak out at a time in which black women were afraid to do so. Johnson would eventually be awarded the Presidential Medal of Freedom in 2015. Vaughan would later head the programming section of the Analysis and Computation Division at Langley. And Jackson would influence the hiring and promotion of women at NASA in science, engineering and mathematics. “Hidden Figures” quietly and simply portrays the struggles of these three women to work in a white-dominated and male-dominated field. The film beautifully portrays how each woman, in her own right, overcame and won the respect of their co-workers both black and white. “Fences” (rated PG-13) is available as a digital download on iTunes, Google Play and Amazon Video, and will be released March 14 on DVD. Running time: 139 minutes. Directed by Denzel Washington; screenplay by August Wilson; main cast: Denzel Washington and Viola Davis. See IMDB for full details. “Hidden Figures” (rated PG) will be available for digital download in late March and released April 11 on DVD. Running time: 127 minutes. Directed by Theodore Melfi; screenplay by Theodore Melfi and Allison Schroeder; main cast: Taraji P. Henson, Octavia Spencer, Janelle Monáe, and Kevin Costner. See IMDB for full details. 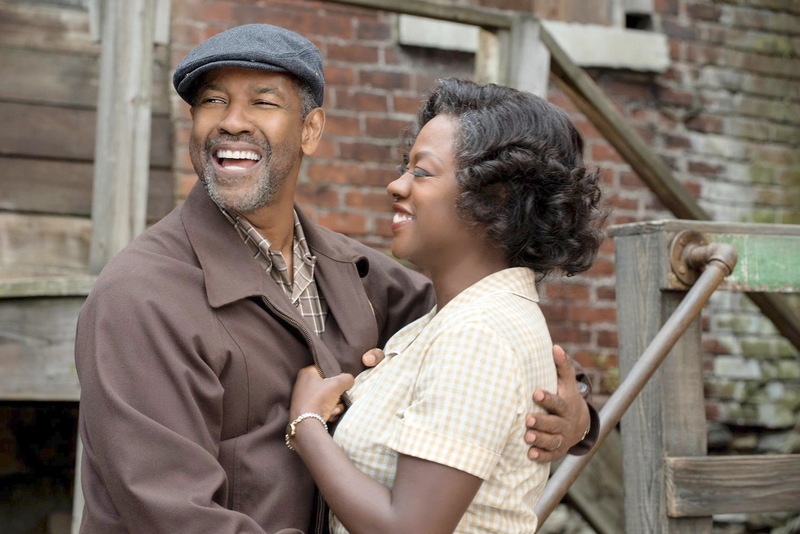 Photo at top: Denzel Washington and Viola Davis in a scene from “Fences” (courtesy Paramount Pictures). Thank you, Dr. Winings, for your thoughtful analysis of various new cinematic offerings. I do go to the movies once in a while but there are many movies out there and it is not always easy to keep track of the meaningful ones. I appreciate that you take the time to let us know about some of them, so that when the opportunity comes, we can pay attention. Thank you, Dr. Winings, for sharing about the signifance of those two films. My wife and I saw “Hidden Figures” which shows how talent and perseverance can overcome obstacles. I contrast that film with “Moonlight” which explores a young black man’s torment from his peers and drug addicted mother. While the Academy gave it the Best Picture award, I thought “Hidden Figures” was performed better and had an upbeat and powerful message for all. I have not yet seen “Fences,” but plan to. I was so happy to read this film review. Applied Unificationism seems like a blog that started for the sake of educating on Unification Thought-centered topics, but reading something like this really brings a spring breeze. I was really happy to read a creative and emotional article such as this one!